I lived in Bellingham, Washington for 10 years before moving back to Canada almost 5 years ago. Though I moved around a bit after graduating high school, it wasn't until Bellingham that I finally felt settled and at home. And it's not just Bellingham, but the entire Whatcom County that feels this way for me. My decade there had ups and downs and sideways events. I changed jobs, partners, friends, and myself. When it was time to leave, it was time to leave...there are a lot of places to go in life... and I'm always happy to go back to visit family and friends. Angel's family and childhood home is out in a more rural part of Whatcom County, surrounded by fields of corn and berries with dairy farms nearby. It's pretty awesome there. Actually, anywhere in the county is pretty awesome and you can experience it all - from the ocean to lakes to farmland to an active volcano (but not too active thank goodness) - in a small corner of Washington State. It's nice to still have roots there too. Out in these rural parts there is always somewhere to explore, with new things to see and new ways of seeing them. This is where I live my "vicarious" farm life. On this particular visit, we tried to sneak a peek at the owl that lives in the old family barn. We found quite a bit of evidence (droppings), but not the owl. With the setting sun filtering through the gaps between the siding, however, the climb to the loft was well worth it. A visit with Grandma Betty brought about a history lesson on rooster caponizing. A tool set that was used by her father still existed and we investigated. If you don't know what caponizing is, you will once you see the photos below. The thought itself isn't very pleasant, but it's amazing to me that her father bought this kit, read the directions, and then went to town performing this task. There were even pencil marks inside the box lid indicating how many "surgeries" he performed. There were quite a few. Anyone else hoping that the chickens at least got a shot of whiskey before having their "chocolate-drops" removed? I love this koi pond. I may even need my own koi pond one day. I think I'll work on that. 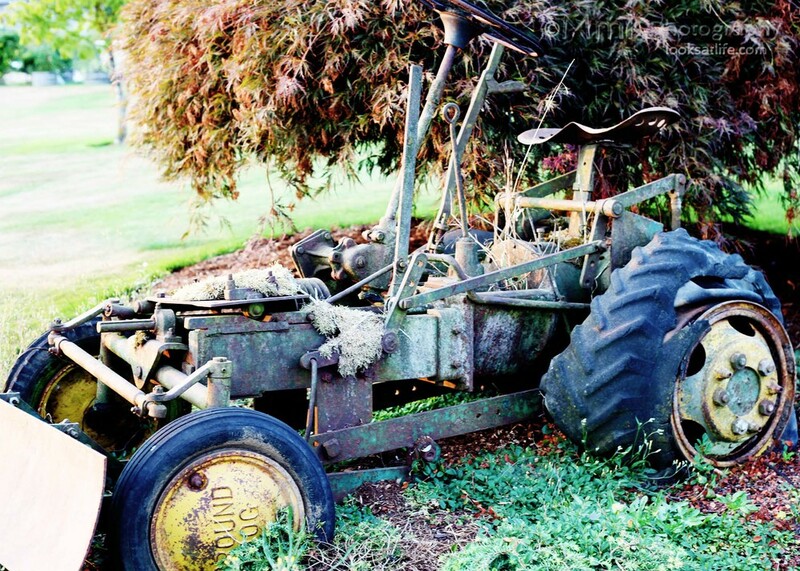 Like I said, there is a lot to discover, like old unearthed farming implements that make great garden additions. And, of course, the ever-changing landscape of the surrounding fields. Every season brings something new, so walkabouts are necessary. I've noticed that my photos were mostly taken during sunset, which is pretty amazing in these parts when the weather is nice. The "golden hour" is truly golden. If you haven't seen the second half of this trip (which I wrote first), keep scrolling to the next post. There you will see what the drive home looked like. Thanks for traveling along with me.